Discover how SolarWinds® Network Automation Manager can complete your IT management toolset. Network automation software can provide insights into Fault, availability, performance, bandwidth, configuration, and IP address management in a single console. From 1,000 to tens of thousands of nodes. Deeper visibility and smarter scalability whether you are covering large environments, critical data centers, or multiple remote locations. Dashboards, alerts, and reports are easily customized to meet your exact monitoring needs. Do-it-yourself installation and deployment does not require professional services or consultants. Reduce network outages and improve performance with advanced network automation tools. 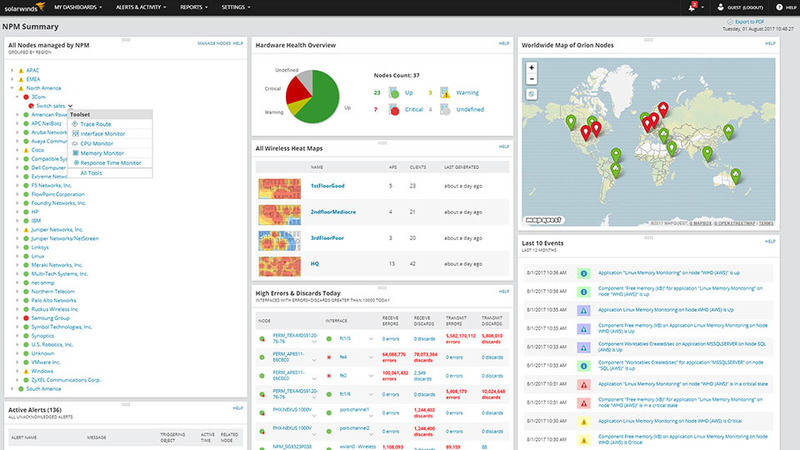 Reduce network outages and quickly detect, diagnose, and resolve network performance issues. With critical path hop-by-hop analysis and visualization all along the service delivery path, you can view network performance and traffic details, regardless of device location. Network automation systems for traffic analysis and bandwidth monitoring. Alert on network bandwidth and traffic patterns with typically up to one-minute granularity. Be able to collect, monitor, and analyze NetFlow, sFlow, J-Flow, IPFIX, and NetStream data to help you identify how much traffic is on your network and which applications are being used. Network automation software for network change and configuration management. Monitor, back up, and bulk-deploy network device configurations so that you can recover quickly from hardware faults and human-caused configuration errors. Receive real-time change notifications, and help ensure that devices are configured and operating in compliance with regulatory standards, such as PCI, SOX, HIPAA, and more. Compare configs side-by-side to quickly determine what has changed. Know how switches and ports are being used, and which switches are nearing capacity. Know who and what is connected to your network, and when and where they are connected. Track endpoint devices by MAC and IP address on your wired and wireless networks. Using Cisco® IP SLA technology, you can simulate traffic data to test the network between Cisco routers or a remote IP device to monitor the performance of key apps and services. Automated subnet discovery and IP scanning scours your network so you know how IPs are used. Know when IPs conflict, subnets/scopes are depleted, or DNS entries don’t match. Find an open IP and make the DHCP reservation and DNS entries in one motion from a single console. Protect your Orion® environment against operating system crashes, application failures, network connectivity problems, and database availability issues. Enterprise monitoring for any application, any server, anywhere with Application-Centric Monitor. Monitor your entire on-premises, cloud, or hybrid application and systems environment with one of our 1200 + templates or create one of your own with Application-Centric Monitor (ACM). Descripción general de las características Discover how SolarWinds® Network Automation Manager can complete your IT management toolset. What are network automation tools? Network automation tools may consist of monitoring, management, and configuration solutions for network devices and infrastructure. Network automation functions are typically performed by a network engineer, or a network or IT administrator.